Endicott & Swett, “Brown's Indian Queen Hotel,” Histories of the National Mall, accessed April 22, 2019, http://mallhistory.org/items/show/445. There was a hotel on this part of Pennsylvania Avenue starting in 1805. 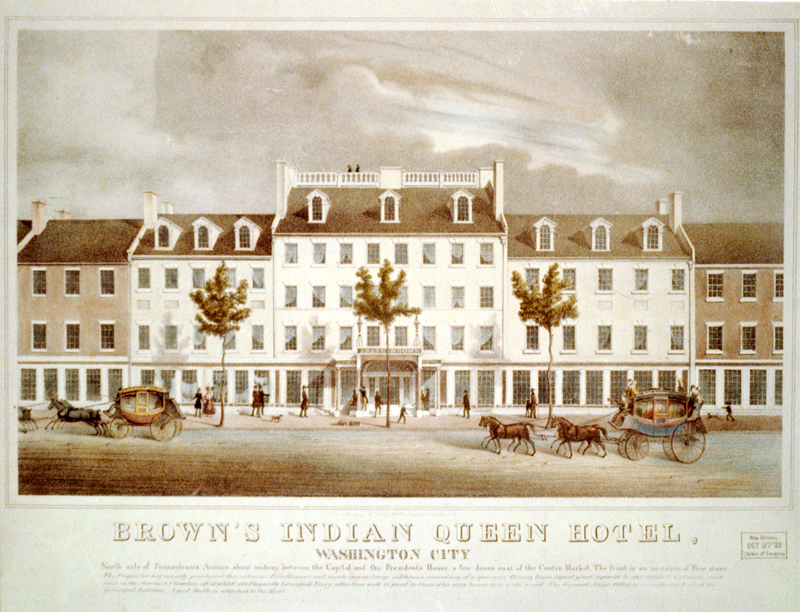 In 1820 the business was bought by Jesse Brown in 1820 and the place was renamed Brown's Indian Queen Hotel. The hotel was popular with out of town visitors and congressmen alike. This lithograph from the 1830s describes it as "midway between the Capitol and the President's House." In 1856 the hotel was renamed the Metropolitan, and remained open under this name until 1932.